Currently on a journey to creating a mobile app. Starting in swift, but to quickly prototype an app. 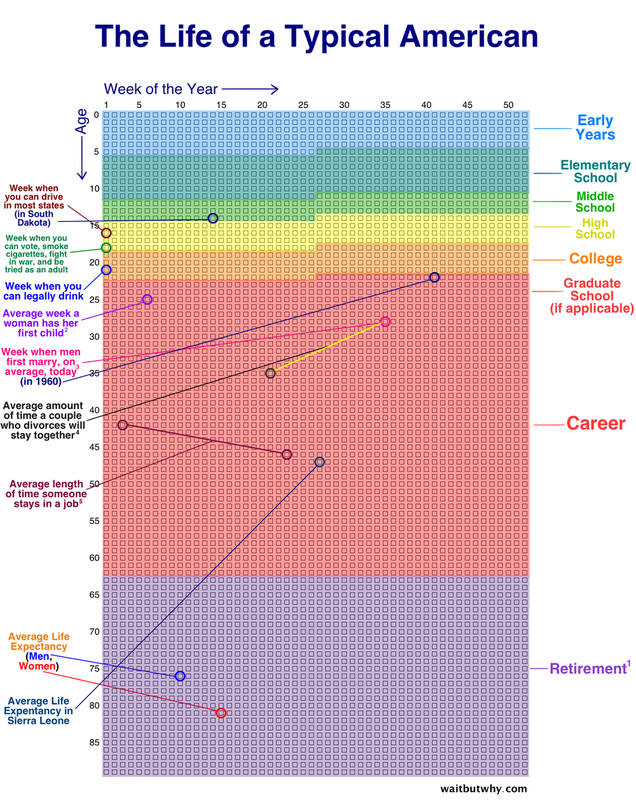 The idea comes from a blog post from waitbutwhy, and to challenge the current system of time. Essentially how we view life and our time here in it. Both the week chart above and the life calendar are a reminder to me that this grid of empty boxes staring me in the face is mine. We tend to feel locked into whatever life we’re living, but this pallet of empty boxes can be absolutely whatever we want it to be. Everyone you know, everyone you admire, every hero in history—they did it all with that same grid of empty boxes. I'm just at the start of the career stage. Its a strange feeling to be defined by our careers. A tough decision, my first job outside school wasn't where I wanted to be, so here I am writing about app development, not really because I want to be an app developer, but because I have an idea and no one else is going to build it for me. So I started with a basic wireframe in Sketch. So i figure we start with a sign in, and onboarding then show the 90 year view and then you can swipe to all the different views from left to right like reading a book each vooming in to the next level of view, but keeping it all in the realm of weeks. Essentially a countdown of sorts. No calendar days mentioned, but just the number of weeks you've lived. Then some other features I was playing with was a profile view and a weekly reflection and milestones. So I started on xcode and started programming it all, but it didn't feel right. It wasn't motivating enough. I wanted to build it with all the design components. So I took a day off and started designing the logo and all the views. There's the logo. I designed, played with circles and triangles, but ultimately decided on tear drops. The colors play with the idea of fire and smoke wisping away, but really it could be whatever you want it to be. Ambiguous. Once I had that the rest was fairly easy.